Water conditions are now at peak spring melt levels, as warming temperatures melt snowfields and glaciers at higher elevations. There is certainly dredging to be had, but I prefer to just play around this time of year, and wait for the water to settle. It is a good time for moving equipment around, and to prospect and metal detect for gold. It is also a good time to do those household chores! The drive from Anchorage to Crow Creek Mine on the Seward Highway is a spectacular one. On one side of the road is Turnagain Arm, a glacial fjord. On the other side, cliffs rise into the Chugach Mountains. There area is rich in wildlife; beluga whales and even a rare orca (killer whale) are seen in the Arm. Eagles are common, and the mountains are dotted with Dall sheep, mountain goats, and bears. So it was that on this drive I had a chance to stop and take pictures of a Dall sheep next to the road, with a lamb perched on the cliff above. I've been packing my 6" dredge out of Crow Creek Mine, where it has resided for the last couple of years. 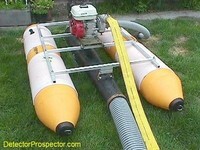 I've decided to sell the 6", and downsize to a 5" dredge. The 6" has been a very good unit for me, but recent regulatory changes in Alaska have made me decide to go to a smaller dredge. All dredges in Alaska must have an EPA permit. Dredges with a 4" nozzle opening and smaller require a free permit with a simple set of requirements. A more stringent permit, with reporting requirements, has been required of dredges with a nozzle opening larger than 4". Keep in mind that a typical 5" dredge, so designated by the manufacturers because of the hose size, usually has a nozzle opening of 4" to prevent clogs, and so would be designated a 4" dredge under these permits. As if it was not bad enough that larger dredges had a more stringent permit requirement, the EPA permit for dredges with a larger than 4" nozzle opening (the Medium Dredge permit) has expired as of June 30, 1999. This General Permit has not been replaced, and so now anyone wishing to use a dredge with a larger than 4" nozzle opening is in for a major permitting process. An Alaska Placer Mining Application (APMA) must be applied for. There is a $100 permit fee. This permit is reviewed by ALL applicable State and Federal agencies and is subject to public review and comment. It is advisable to file this permit no less than 6 months in advance. You must provide a detailed Plan of Operations, and you can expect the agencies to add additional requirements to whatever plan you submit. 2012 Update: Dredges with a less than a 6" nozzle opening are now considered "small dredges" and fall under a general permit with no special cost or reporting requirements. But as always, check for the latest rules as this page will no doubt be out of date when you read it. A process of this sort may be appropriate for a full-time, large scale dredging operation. It certainly is not for casual, weekend miners such as myself. The worst part of it is that if you wish to move to a new site, you must go through the whole process all over again. I've avoided the issue by restricting my nozzle on my 6" dredge to 4", which has made it a wonderfully non-clogging dredge, and allows me to operate under the EPA Small Dredge permit. Ultimately, however, I am carrying more equipment than I need, as a 5" dredge with a 4" nozzle will move nearly as much as a 6" dredge with a 4" nozzle, as long as care is taken to not clog the hose. I plan to use a 5" subsurface dredge. My dual 5.5HP engine 6" weighs about 400 pounds. A single 5.5HP powered 5" subsurface will only weigh about 150 pounds and will burn one-half the gas as the 6". I'll move about the same yardage, but at a higher percentage of gold loss per yard. In the areas I work, however, I feel the loss will be acceptable, when I consider packing 250 lbs. less equipment into remote sites. Add to that a reduction of 50% in fuel, and I'll save my back a lot of work! The pictures above are of a unit I built and used last fall on my claims on Mills Creek. It uses a 5.5HP Honda pump, running into a 5" suction nozzle that pushes the material back through 15' of 5" hose to the underwater sluice box. I liked the light weight of the inflatable pontoons floats, but I am worried about them abrading against rocks and sinking, so I plan to go to marlex floatation this year. The recovery system/sluice box on a subsurface dredge is underwater, with a riffle area about 8" wide by 24" long. The fact that you are not lifting the material above the surface of the water is what keeps the horsepower requirement small, which cuts the weight and expense of the dredge considerably. I have used these units often in the past, and am very happy with subsurface units in general. I plan to use the 5" subsurface on Crow Creek in the future. I have another, even smaller 4" subsurface that I plan on using at Mills Creek this year. Subsurface dredges have a higher gold loss than most surface units, but are MUCH lighter. A 5" subsurface dredge can be built that is as light as a 3" surface dredge and with the same pump. While it may have a higher percentage of gold loss per yard moved than the 3", the 5" will move 2-3 times as much material. The final result is that you will normally get more gold by the end of the day with a 5" subsurface than a 3" surface dredge. In areas with fine gold, and higher loss rates, the difference will not be as dramatic. In fact, in areas with extremely fine gold, the 5" may even get less gold even though more material is moved, as the loss rate can be very high on extremely fine, flaky gold. In areas with coarse gold, the 5" subsurface will get 2-3 times more gold as the 3" surface unit, as the loss rate on coarser gold is negligible. I frequent areas with coarser gold, and that tend to require a lot of backpacking, so the subsurface dredge is a great way to go for me. I spent part the day packing more equipment out of the canyon. I'm doing it a few loads at a time, and then spending the rest of the day playing. I wandered up the creek metal detecting and hit the area that I had found on my last trip up to the mine. No dramatic new results, just more small nuggets. A couple of hours metal detecting netted me 19 little nuggets, totaling exactly one pennyweight (1/20th troy ounce). At some point I will have to hit this area hard for a full days work to see what I can get. For now, however, it is simply a nice way to work in the morning packing equipment, and still get a little gold by the end of the day.